"Disobedience, in the eyes of anyone who has read history, is man's original virtue. It is through disobedience and rebellion that progress has been made." U.S. Navy Cryptologist Technician (Collection) Petty Officer 1st Class (Expeditionary Warfare Specialist) Michael J. Strange, 25, of Philadelphia, Pennsylvania, assigned to an East Coast-based Naval Special Warfare unit, died on August 6, 2011, of wounds suffered when his unit's helicopter crashed in Wardak province, Afghanistan. He is survived by his fiancee Breanna Hostetler, parents Elizabeth and Charles, and siblings Katelyn, Carly, and Charles. Nicole Carroll 3:36 (155lb deadlift, 65lb thruster), Michael Giardina 4:01. CrossFit Level 1 Certificate Courses: Trident CrossFit, CrossFit - TNT, CrossFit Southie, CrossFit Park City, CrossFit Bellevue, University of San Diego, CrossFit Strong, CrossFit Laredo, Mundo CrossFit, Reebok CrossFit Stockport, Crossfit Melbourne, Moscow, Russia. Jimmy Bowman and Courtney Samway. CrossFit SoCo at the South West Regional. Basketball ball enjoying last week of spring training at BU CrossFit. CrossFit Level 1 Certificate Courses: University of Nevada CrossFit, CrossFit Revolution, CrossFit Morristown, Colorado State Patrol, CrossFit Atlanta, Valley CrossFit, Reebok CrossFit YUL, CrossFit Reebok Nurnberg, CrossFit Jozi, CrossFit 506, Camp Lejeune. Poster at St. Jude Children's Research Hospital. 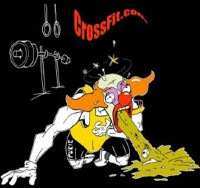 CrossFit for Hope supports research and treatment for catastrophic children's illnesses. Sign up or contribute here.